For those looking for a spectacular holiday in a wonderful location, the 5-star Labranda Miraluna Village & Spa provides guests with a luxury stay. 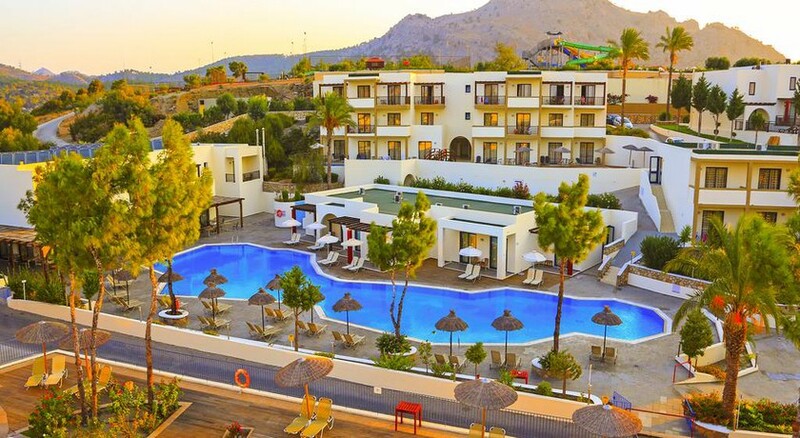 Located in Kiotari on the island of Rhodes, guests have access to a private shingle beach and the wonderful ocean. This modern and expansive resort is all about ensuring guests have a comfortable and relaxing stay with elegant rooms that are stylish and lavish in every way. The buffet restaurant, snack bar and bars are ideal for those who like to dine in style and try a selection of beverages while there are restaurants and bars located outside of the complex. The Labranda Miraluna Village & Spa comes with outdoor pools, a wellness centre and plenty of options for the little ones, making this the ideal destination for all. The nearest beach is just a few hundred metres away, enabling guests to embrace the private beach and its wonderful setting. The resort is perfect for those who like to explore and with restaurants and bars on offer, guests will always be able to find something that suits their needs. The peaceful setting of the complex means that guests can head off to many off the secluded beaches where they can try their hand at water sports while there are many historical attractions in the area. The airport is 60km from the hotel. This amazing complex provides guests with rooms that are both modern and spacious while ensuring that they feel relaxed from the moment they arrive. With Superior Rooms, Family Rooms and Standard Rooms available, guests are sure to find something that fits their needs and all come with an array of facilities. Each room has air conditioning, satellite TV, en-suite bathroom with shower and hairdryer as well as free WiFi and a balcony. On-site there is an international buffet restaurant that serves guests with a choice of dishes for breakfast, lunch and dinner. Once guests have finished dining, they can head to the lounge bar where they can relax in style with a cocktail or local beverage. During the day, the poolside snack bar serves up a great choice of drinks and snacks and outside of the complex guests can choose where they dine and drink as there are many bars and restaurants available to choose from. The complex caters for adults and children, providing the perfect fun-filled holiday. There are four pools to explore and a children’s pool along with a playground and kid’s club. There is a spa and wellness centre where guests can enjoy an array of treatments or hit the gym to workout. There are pool tables on site and a mini amphitheatre where shows and activities take place throughout the day. April 2018 - went for a week with my boyfriend for his birthday. What a beautiful place! So luxourious. Staff were so friendly! Variety of food was good. Buffet wasn’t the best but gyros, pizzas, Italian restaurant, amazing! Beautiful beach bar! I just wanna go back. Having reading some of the reviews we did not know what to expect but on arrival I think they must have been staying somewhere else. Rooms, food, overall service was fantastic, close to the beach (and AI bar). Pools are well kept & cleaned every day, the off restaurant food area (pizza & kebabs) 1st Class. Would definitely return & have recommended the Miraluna to our friends. The hotel was nice and clean, modern food was good. The only down side was the size of the rooms the one we had was tiny in fact we joked that they had put us in the broom cupboard. The other down side was the all inclusive bar finished at 10.30 and there was never anyone serving, so you always had to wait. It was nice place to stay, but not as rated. Just reopened for season business, everything was being painted or cleaned including pools. But staff managed things well. No complains at the end, except booked the Kiotari 5* resort and paid but they changed it at last moment saying it's still under refurbishment.